It was a Friday. A very boring Friday. Well, at least I think it was a Friday... Either way, it was a dull day. I was doing my usual annoy the dogs routine when I got a call. "Ade, guess what? We are looking after an orphaned Fishing Cat." "A what now?" At the time I was researching leopards, and knew very little about Fishing Cats. "A Fishing Cat. Your uncle did a study on them 6 years ago. Come see it." 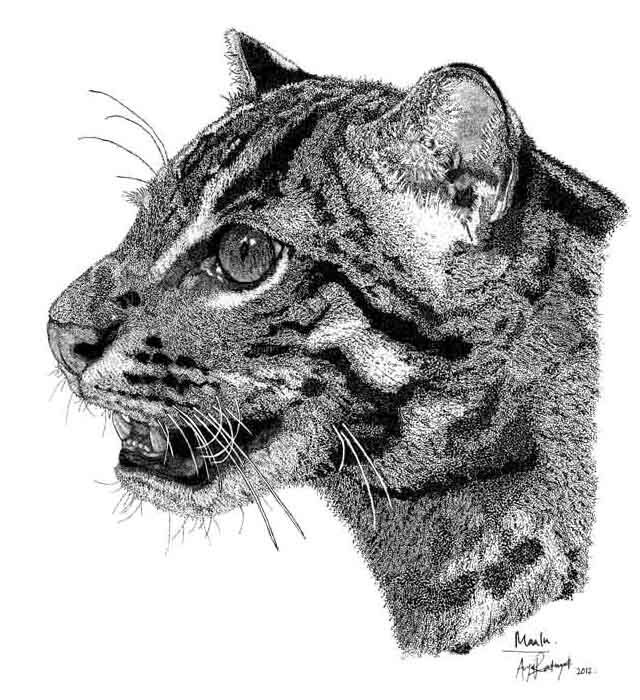 Anya Ratnayaka made this drawing of Maalu, the Fishing Cat. Maalu was rescued from a burning field but died of feline parvovirus infection in September 2012. Interested in buying Anya's cat art ?? Contact her ! !